Below is a summary of my MS pain/medication experience and management. For those of you who have been following me, you know that pain is my most significant symptom. For the first five years of my MS progression, it was strong and increasing, which is why I was constantly increasing the medication dosage and always looking for something better. You should also know that I have had painful problems with my C-spine, independent of the MS, including a C-spine surgery in year five (and a misdiagnosed L-spine surgery in year two). As one doctor from Stanford said, anticonvulsants have strong side effects. However, we use a cocktail of two (or more) of them, so we can get the additive benefits with less than additive side effects. Gabapentin (e.g. Neurontin or Gralise) and Pregabalin (Lyrica) are both gabapentinoids, which makes them easy to transition between. Those and Carbamazepine (Tegretol) are all anticonvulsants. 600 mg Gralise (gabapentin XR): Moderate help with daily and nightly pain. MS stands for Multiple Sclerosis, which basically means "many scars." The scars develop in the central nervous system (CNS), composed of the brain and spinal cord, as the result of an attack from the body's own immune system. In a normal body, an attack of the CNS would still be a pretty awful thing, but the body would fight the attacking agents, clear away the resulting plaque, then begin to repair the damage. Sclerosis is a type of scar tissue which is atypical of a cleanly healed injury. In people with MS, the immune system is stuck in fighting mode, commonly thought to be the result of high levels of inflammation in the body. This keeps the CNS stuck in defense mode, preventing normal healing of the damage. The attack is not the result of a typical virus or bacterial infection, it's actually the body's own immune system doing the damage. 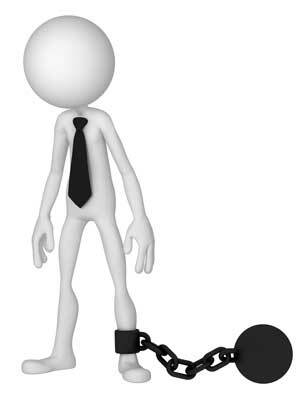 This process is referred to as "autoimmune" (immune system attacking the self). Dr. Stephen Gundry refers to this process as "friendly fire." There are a hundred or more different autoimmune diseases. Some of the most common ones are Graves' Disease, Hashimoto's Thyroiditis, Lupus, Type 1 Diabetes, Chron's Disease, Rheumatoid Arthritis and Multiple Sclerosis (MS). Read more: What is MS? 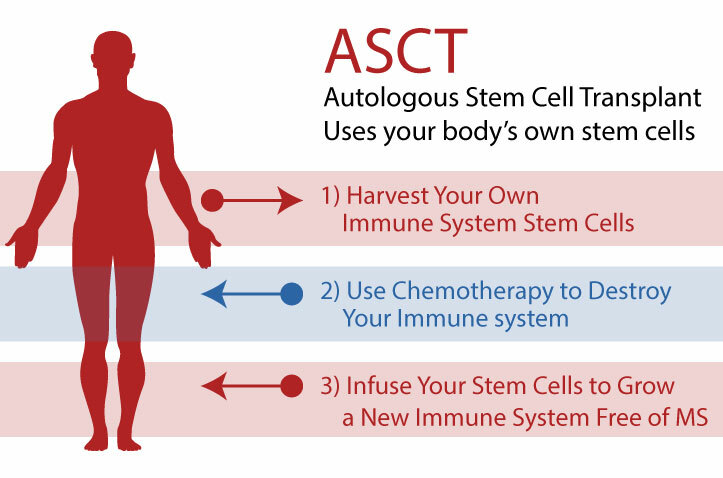 Analogous Hematopoietic Stem Cell Transplant, sometimes abbreviated as ASCT or HSCT, is a process by which your own (analogous) hematopoietic stem cells (i.e. immune system stem cells), grown in your own bone marrow, are harvested from your body (usually through your blood), then given back to you after chemotherapy (which wipes out your existing immune system) to rebuild a new immune system (without memory of your autoimmune disease) from scratch. This is in effect a reboot of the immune system. There are many types of stem cells in the body, each which can grow in to particular types of new cells. Hematopoietic stem cells grow into new immune cells, and they are abundant and easy to capture. Furthermore, a mobilizing drug (i.e. 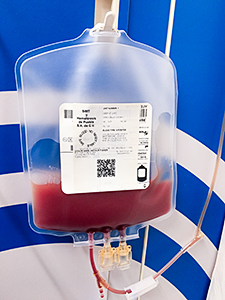 filgrastim) can be used to encourage the bone marrow to generate HSCs by the millions. 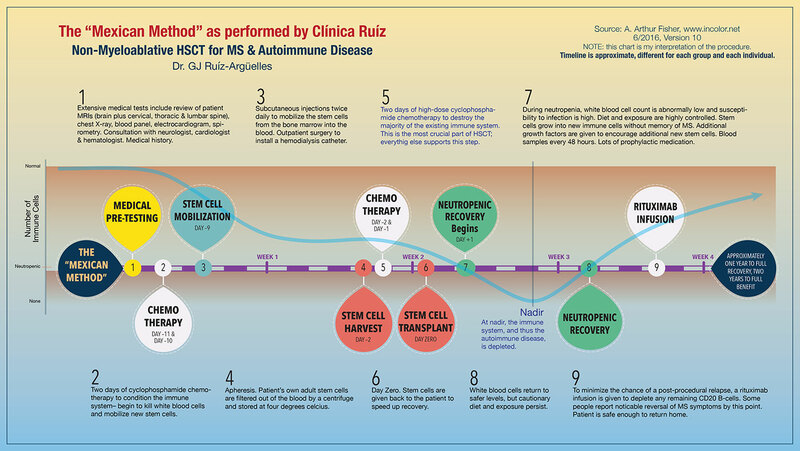 HSCT (aka ASCT) for autoimmune disease (i.e. MS) is not yet FDA approved in the USA, and therefore most Western Medicine neurologists have little or no idea what the treatment is, what it does, or how safe it is. Read more: What is HSCT? This video explains HSCT in the words of one of the procedure's primary pioneers. If you do nothing else on this website, watch this presentation. Note that I applied to Dr. Burt's clinical trial and was rejected as I hear most everyone is. He seems to want only people who get really sick, really fast but haven't been sick for terribly long. Below is a timeline I created of the "Mexican Method," as performed by Clínica Ruíz. This protocol is a little different from that of Dr. Richard Burt and Dr. Shimon Slavin, who were the pioneers of this amazing process. As of this writing, this process is not yet FDA approved in the USA, but it is in a Stage 3 Clinical Trial. The Mexican Method, illustration by A. Fisher version 10, updated 6/17/16 *Subject to Change!